Parking meter is a device used for collecting revenue in exchange for parking a vehicle at a particular place for limited time. Parking meters can be used as a tool for enforcing the street parking policy by municipalities. Parking meters are generally installed in high traffic areas. Parking meters are part of both public and private agencies’ parking management solutions. Public infrastructure such as transit stations, libraries, stadiums, tourist attractions, civic buildings, universities and hospitals generate high parking demand which is major driver for parking meter market. Traffic congestion caused by vehicles is an alarming problem both in developed as well as developing countries. IoT based technology provides the required solution where tasks such as finding a parking space are automated giving boost to installation of parking management solutions. The global parking meter market is expected to expand at a CAGR of 6.95% during the forecast period from 2017 to 2025 and is expected to reach US$16,454.1 mn by 2025. The global parking meter market can be segmented on the basis of technology, parking mode, application and region. In terms of technology, parking meter market can be divided into parking meter (single space), parking kiosks (multi space). In 2016, Multi space parking meters holds the largest revenue share for parking meter market and is expected to retain the largest share throughout the forecast period due to high demand for parking kiosks owing to low maintenance cost associated with the technology. On the basis of parking mode, the parking meter market can be segmented into pay and display, plate, space and others. Due to greater penetration of pay & display and ease of access, pay & display held the largest market share in 2016. In terms of application, the market can be classified into government institutions, hospitals, parks, transit systems, malls & stadiums and others (institutions, residential etc.). Among application, parks are expected to generate high demand for parking and in turn parking meters due to increasing disposable income among the growing population. Geographically, parking meter market can be divided into North America, Europe, Asia-Pacific, Middle East & Africa and South America. North America is expected to hold largest share among global parking meter market. Asia-Pacific is expected to witness highest CAGR during the forecast period owing to growing population in the emerging economies such as China and India. 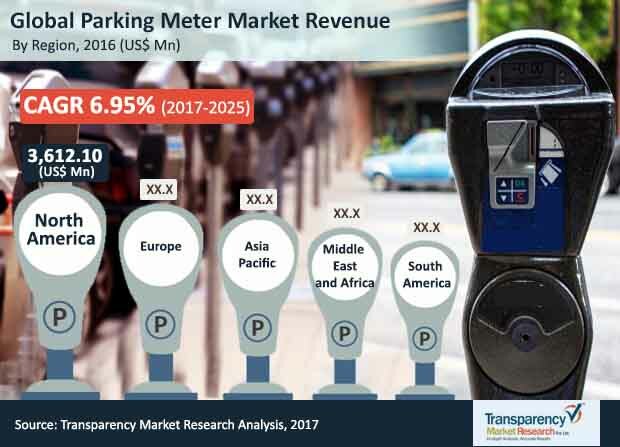 Factors such as technological developments, rising adoption of smart devices and increased demand for these devices from emerging markets are expected to drive parking meter market in the coming years. Moreover, growing automotive industry due to high demand for automotive are generating high demand for parking solutions which is also driving the parking meter market. The intensifying traffic congestions and need for effective parking systems to address parking concerns are providing several growth opportunities for parking meter market over the forecast period. Some of the major players in the global parking meter market with the significant developments are Cale Access AB, CivicSmart, Inc., IPS Group, Inc., LocoMobi Inc, J.J. MacKay Canada Limited, METRIC Group Ltd, Parkeon S.A.S., Parking BOXX, POM Inc., Ventek International and Worldwide Parking, Inc. among others. The global parking meter market is highly fragmented with number of companies operating in the segment. Leading players are currently focusing on providing cost competitive and customized solutions to the customers. Moreover, as part of this strategy, the companies are engaging in various strategic partnerships, acquisitions, focusing on expanding their business through new service additions and geographical presence. This report aims to provide a comprehensive strategic analysis of the global parking meter market along with revenue and growth forecasts for the period from 2017 to 2025. With fast changing technology use in various applications and rising adoption of this technology for parking solution, the parking meter market is expected to experience high growth in the coming years. Some of the factors supporting the growth of the market worldwide include the intensifying traffic congestion, increased technological investments in developing regions such as Asia Pacific, high demand for parking meters from parks and advent of customized solutions in developed regions such as North America and Europe. The impact of these and other macro-micro economic factors has been analyzed while developing the market growth models. This report on the global parking meter market provides a detailed analysis of parking meter solutions used for different applications by end-users depending upon their needs. The report offers an in-depth analysis of the market drivers, restraints, and growth opportunities. Using these factors, the study identifies various trends prominent in the industry which are expected to influence the market growth during the forecast period from 2017 to 2025. It includes a comprehensive coverage of the underlying economic and technological factors influencing the parking meter market growth. It provides the competitive landscape of key players in the parking meter market in order to highlight the competition scenario. The report also provides a detailed competitive analysis of the key players in the market and identifies various business strategies adopted by them. The study explains the penetration within each market segment across various geographies, and how these segments have accelerated the growth of the market as a whole. The global parking meter market is analyzed by segmenting it on the basis of technology, parking mode, application and geography. Based on technology, the market is classified into parking meter (single space) and parking kiosks (multi space). This segment considers revenue generated from single space parking meters as well as multi space parking meters (parking kiosks). Based on parking mode, the market is categorized into pay & display, plate, space and others. In terms of application, parking meter market can be segmented into government institutions, hospitals, parks, transit systems, malls & stadiums and others (institutions, residential etc.). Geographically, the global market for parking meter has been segmented into five regions: North America, Europe, Asia Pacific, Middle East & Africa and South America. The market size and forecast for each region has been provided for the period from 2015 to 2025 along with the CAGR (%) for the forecast period from 2017 to 2025. The study also includes market estimates for major countries/regions such as the U.S., Canada, the U.K., Germany, France, Japan, and India. The analysis by component, end-user and regions helps in evaluating the present scenario and growth prospects of the parking meter market over the forecast period from 2017 to 2025. Thus, the report provides in-depth cross-segment analysis of the market and classifies it into various industries, thereby providing valuable insights at the macro as well as micro levels. The report concludes company profiles of major players in the industrial internet of things market on the basis of various attributes, such as company overview, financial overview, business strategies, SWOT analysis and segment presence. Some of the major players in the global parking meter market with the significant developments are Cale Access AB, CivicSmart, Inc., IPS Group, Inc., LocoMobi Inc, J.J. MacKay Canada Limited, METRIC Group Ltd, Parkeon S.A.S., Parking BOXX, POM Inc., Ventek International and Worldwide Parking, Inc. among others.